The Something Collective – We are a group of practising London based artists, working in a range of media including painting, installation, printmaking, sculpture and interactive pieces. We are a group of practising London based artists, working in a range of media including painting, installation, printmaking, sculpture and interactive pieces. We are a group of practising London based artists who meet regularly to discuss and develop work. Through a wide range of art practices including drawing, sculpture, painting, textiles and mixed media, we find we have something in common; we are interested in producing work that speaks of something that cannot be explained or fully articulated in words. There are over 100 pieces – not all by us – and you can see the online catalogue here: https://breakingborders2.wordpress.com/online-catalogue/. You can bid online. The final auction is at Ye Olde Rose and Crown Theatre Pub, 53 Hoe Street, Walthamstow E17 4SA on Sunday 5th June from 1.30pm. Our first show at 5th Base Gallery was a great success! Group curated, ‘Unspeakable’ showcased pieces from each member of the collective, with a range of works including painting, installation, printmaking, sculpture and interactive pieces. Scroll down for pictures of the Private View and information on individual pieces. 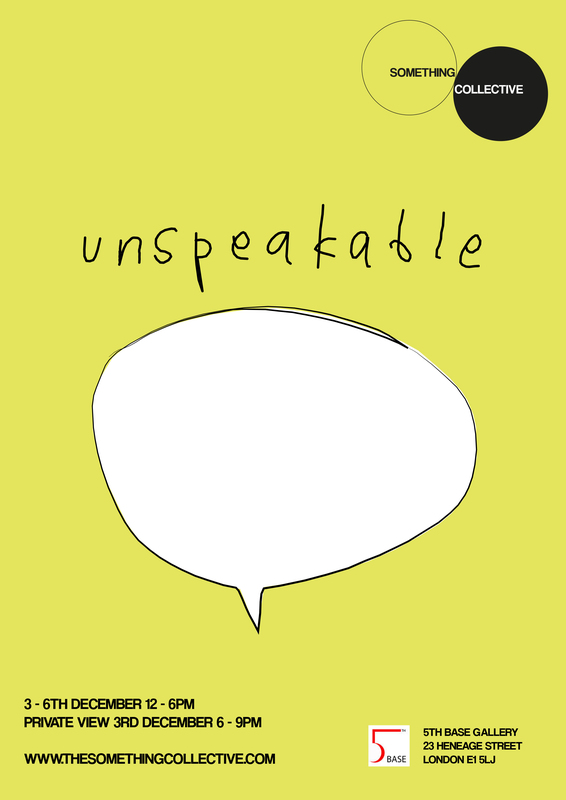 The Something Collective is excited to announce our upcoming show, Unspeakable. We all know what it’s like to live with the unspeakable. Unspeakable has a lot to say. It shouts within us. This exhibition is concerned with perceptions, emotions, experiences and ideas that can’t be contained, controlled, pinned or paired down by the weight of words. This, the first exhibition of The Something Collective , is an invitation to engage directly with the works on show, with their individual narratives and with the wider dialogue that emerges from their association. Using a range of media, the artists from The Something Collective respond to acts, desires, structures and complexities that render us speechless.